March 23rd; it is a late Holi Festival this year. 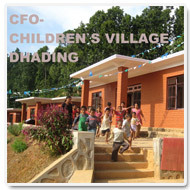 Our children and youths celebrate vigourosly in the streets of Kathmandu and at the CFO-Children`s Village in Dhading. Let us enjoy this special time together with friends and relatives, neighbors and Nepal-visitors. Holi is an event which unites people of different walks of life and helps to unite beyond well-established boundaries. Copyright © Children's Future Organization Nepal 2009, All Right Reserved.